exile wrote: This really looks fascinating, Herbert, but a different world from AS/Moho. The hero with the quick draw (with his weapon) seemed to be a 3D character with a 2D look. I suppose the way to understand this stuff would be to get to know Blender as a 3D program first. Thanks for keeping us informed. The hero with the quick draw is a completely 2D hand-drawn character! No 3d is used at all - aside from having the 2d drawing living in full 3d space. The beauty of the way 2d drawings and modifiers/effects are implemented allow for the freedom of editing demonstrated in the videos. Hey guys I made a Blender video tutorial for beginners, please check it out! Haven't made a proper video tutorial in a while, I feel like making more of these, woo! Had a quick look on YouTube and was very impressed by the tutorial. A great job! I will find time next week to actually do it! Hey Shanty Baba, thanks for taking a peek and the nice comments! No prior knowledge of Blender is required to follow the video, but if you have any questions later on feel free to ask and I'll do my best to answer them (I'm still learning Blender myself). Thanks for the hard work in making this tut. I got through the "hard part", couldn't find a way to limit the movements of the walls along one axis at a time. The icon for a widget to do that doesn't do anything for me. Could only move them manually with the right mouse button. But there will be a solution. Thanks for the tutorial. I also subscribed to your YouTube channel. uddhava thanks so much for subscribing! You rock! If you have any questions please let me know! Thanks, Darth Furby. The arrows are a bit tiny on my screen, but they do work. Another nice way to constrain to one direction is pressing G and then x, (or of course y or z as desired) a very comfortable method. I started with Blender a while ago, gave up and forgot everything, so this has been the push I needed to dig back into the low cost kindle version of Blender for Beginners. I was going to subscribe and then noticed I already am subscribed through your drawing tutorials. Happy to hear the widget is working properly! Blender can be a little weird sometimes. I completely forgot to mention the "G" shortcut. And thanks for the subscribe, you're awesome! I just posted in another thread on Clip Studio, which turned into a discussion of Blender, that I've found some good beginner tutorials for Blender. Maybe it should be posted here instead. A guy who calls himself surfaced studio posted three introductory tutorials with a box modeling project which I was able to complete https://www.youtube.com/watch?v=d5luANNKuEc. Another series for beginners by VskorpianC features both 3D and 2D (Grease Pencil) stuff https://www.youtube.com/watch?v=I6dPvOX ... o_Wv6opUs0. Maybe our forum friend Greg Smith will continue with his promising tuts? I'm experimenting: If if's possible to learn Blender at my age, then there's really no problem beyond superficial differences to other software. It's not easy, but neither is Moho when you go beyond the initial stages and actually want to do a complete project. The illusion of there being some easy way to animate might be the reason why so many of us abandon our projects when we hit snags. I wholeheartedly agree. People do think 2D animation should be much easier than it actually is. In many ways, a convincing 2D project is harder to realize and finish than a 3D equivalent. What to do . . .. what to do? If you throw into this mix the incurable desire to constantly be trying and buying new software - well, you'll end up somewhere in the neighborhood where I have been living. Having put a YouTube Channel out there (to see where people's interests lie), I have pretty well concluded that most people who are delving into animation really prefer "FREE" software. Unfortunately, FREE is not always the easiest to use and master - as is the case with Blender. That complicated and cryptic interface still puts me off - though I have learned how to use a lot of functions. When I watch my Blender videos (not having seen them for a year or so) - I am absolutely flabbergasted at the number of steps which must be committed to memory to really use it efficiently. 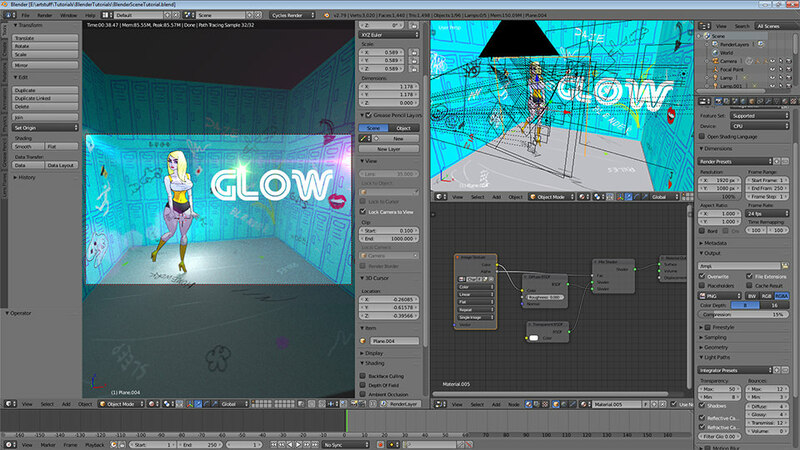 Blender was really designed to be operated with single letter keyboard shortcuts for the most important workflows. As soon as Grease Pencil has been somewhat finalized for inclusion in Blender 2.8 - I'll take a long look at it and see if it is the ultimate solution for 2D animators (as has been hoped for and hinted at by its developers). I will be publishing some Spine tutorials soon - and maybe an entire Udemy Course, as well. Great hearing from you again, Greg. A once for a lifetime purchase sounds pretty good, but first I want to see where the Blender adventure will lead. Yes, it does require a lot of functions that are easy to forget if not used regularly. But if you take a 6-month break from Moho, what would you remember beyond basic functions? One thing that got me interested in 3D is the amount of energy the 2D world puts into emulating 3D functions - every self-respecting Moho user has to provide almost every character with head turns, body turns, foreshortening, change of perspective, etc. There must be some way of calculating how many projects are broken off before completing scene 2, and if the "easier" software has a better quota than the harder types. I'm not a quick learner and certainly not a nerd, so if it's possible for me to ever complete a project in Blender, that would prove it's possible for the average user. But I'm not anywhere near there yet. But it is a fascinating challenge at this point. PS. After going over the Greg Smith (YouTube channel Open Toonz Training) GP tuts again, I have to say there is nothing nearly that information-packed about using GP out there. A wish: that someone with enough knowledge will pick up the ball from there and show how to use those techniques to create and animate multi-colored, multi-layer characters - intially without bones. If I've overlooked such material, please provide a link. I second that exile! More Grease Pencil tutorials would be great, although GP is about to get a major overhaul in the next release.